Washington Governor Jay Inslee talks at a press conference held to welcome a passenger who was blocked from entry last week due to the Presidentâ€™s immigration ban at Seattle-Tacoma International Airport Monday February 6, 2017. Washington keeps all sorts of personal information in state databases. Some lawmakers are working to ensure that the information can't be used to deport immigrants or force Muslims to register with the government. OLYMPIA — Like any 21st-century bureaucracy, Washington collects in vast computer databases all sorts of personal information about state residents. But now Democratic lawmakers and immigration advocates are wondering if such routine data could one day aid any federal effort to identify and deport immigrants who entered the country illegally, or to require Muslims to register with the government. 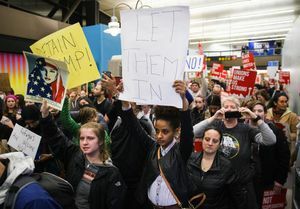 President Trump’s scuttled attempt to temporarily ban all refugees and immigrants from seven Muslim-majority countries has immigration advocates wondering if more actions are coming. Legislation filed in Olympia would prevent the state from sharing data with the federal government that could be used to determine someone’s religious faith. And Gov. 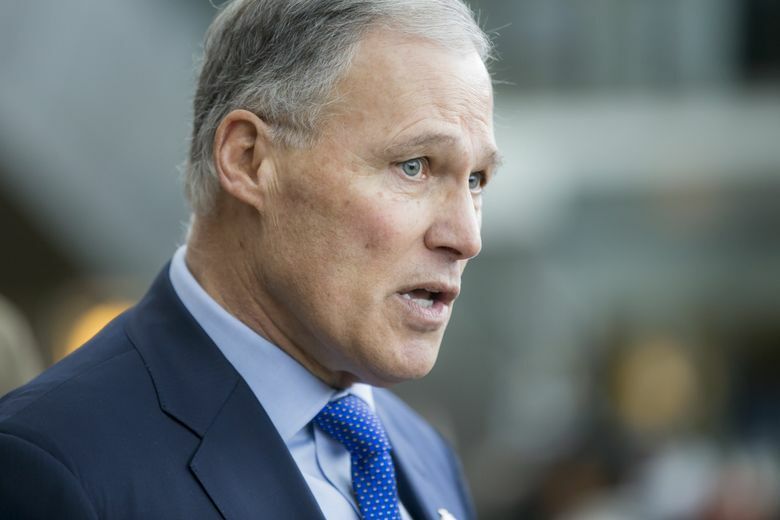 Jay Inslee has directed his staff to identify data collected by state agencies that the federal government could use to learn someone’s nationality or citizenship status, said Nick Brown, the governor’s general counsel. “The governor was curious about getting a better handle on understanding the type of data we collect and why we collect it,” Brown said. And there is a precedent for such data use, said Adam Schwartz, senior staff attorney with the San Francisco-based the Electronic Frontier Foundation, a civil liberties organization. During World War II, the U.S. Census Bureau shared data that allowed the federal government to round up Japanese-Americans and hold them in camps. “If you go to the dawn of American databases, the original sin is the U.S. Census Bureau,” Schwartz said. In Washington, Democratic state lawmakers have introduced bills in both the House and Senate to prohibit the state from sharing information about a person’s religious affiliation for the purpose of setting up a database based on religion. “We joked about how we need to build a wall around Washington to keep D.C. out,” said Sen. Guy Palumbo, D-Maltby, a sponsor of one of the proposals, Senate Bill 5308. “I don’t even want us to have the ability to participate as a state in a Muslim registry,” he said. The state Department of Corrections and the state Health Care Authority could have such information as it relates to people’s religious practices, according to Palumbo. The House version, HB 1956, is on track to get a hearing and a vote in the House Judiciary Committee, said Rep. Laurie Jinkins, D-Tacoma, committee chair. Only one Republican, Sen. Joe Fain of Auburn, has signed on to co-sponsor either of those bills. Fain said he doesn’t believe the Trump administration would actually implement a Muslim registry. “But I’m so offended by the concept, that that is something that could even be talked about, why wouldn’t I want to put my name behind a bill that says we’re not going to do that?” Fain said. While Inslee and state Attorney General Bob Ferguson have launched a legal battle against Trump’s executive order on immigration, Democratic lawmakers have been discussing a broad range of responses to the president’s immigration and refugee agenda. That has included several new policy ideas that go beyond the realm of data-sharing, according to Jinkins and Rep. Jessyn Farrell, D-Seattle. “Our attitude is that this is going to be a long game and these issues are not going to go away,” Farrell said. As part of that, Rep. Lillian Ortiz-Self, D-Mukilteo, is sponsoring HB 2030, intended to outlaw discrimination against people based on their citizenship or immigration status. There’s also discussion about establishing a statewide phone number for people to report instances of discrimination, said Ortiz-Self. And legislators may push for more legal-aid funding that could help immigrants and refugees, she said. GOP legislative leaders last week said the proposals aimed at blocking a Muslim registry are not among their priorities. Inslee has directed his staff to look at what sort of information the state collects on its residents, and whether that data could be used to determine a person’s citizenship status or nationality. Also being researched is whether state or federal laws require agencies to collect such data, said Brown, Inslee’s general counsel. The directive dovetails with the philosophy that states should only collect data from residents that is absolutely needed, he added. The governor’s office hasn’t received any requests for such personal data from the federal government, according to Brown. Inslee’s decision, first reported in The Verge, includes looking at agencies such as the state Department of Social and Health Services and the state Department of Licensing. Because the governor’s office is still examining what data is collected and why, it isn’t yet known if the governor will take action on state practices, Brown added. At least one agency is already addressing concerns about data it collects.